Do other parents feel guilty and sad that they too won’t have the same elated faces on their children’s faces when they present an XBox 360, complete Thomas the Tank engine set (with newest Misty Island Rescue attachments), or any other toy that said child would enjoy on Christmas morning? Have you noticed how even McDonald’s is equating personal fulfillment with food ordered and consumed from their menu this holiday season? 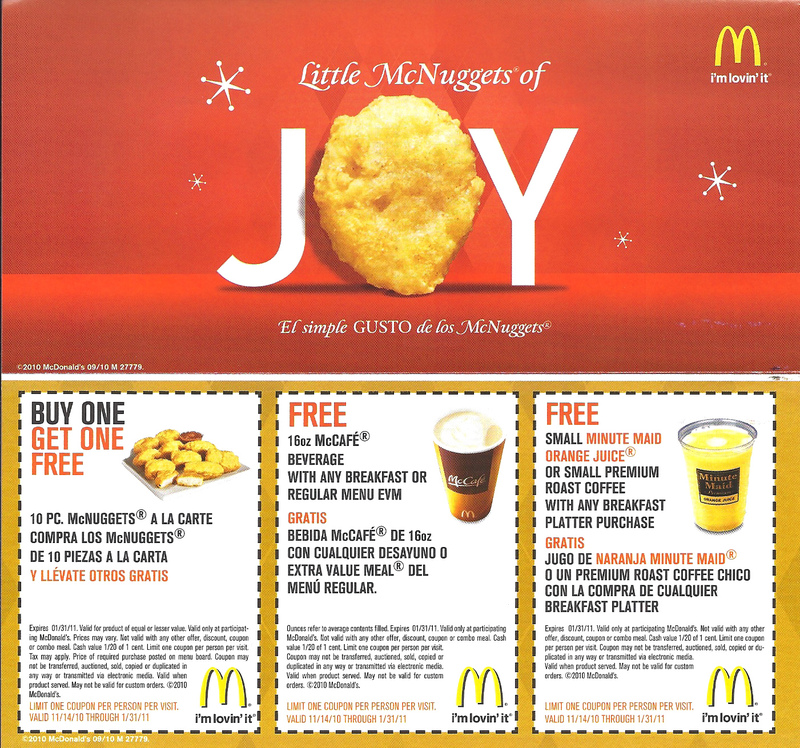 I recently received a coupon like this in the mail and thought "wow, that's so nice McD's sent me a holiday coupon!" and then I realized what I was thinking and that it wasn't a neighborly gesture on behalf of my local golden arches. Though Dave and I are typically content with the lifestyle we’ve chosen of glamorous non-profit student ministry, are creative with our resources and try to live simply, there are times I just am sad or pissed off we don’t make more money. This usually corresponds with what I feel like I should be doing to care for others than what is actually expected of me or desired around the Holiday season. This Christmas we’re facing the tough reality of being addled with two mortgages because our renters moved out this past month, trying to sell our other car to still be a one car family and managing to buy Christmas presents this year. Yesterday when I was carefully selecting some Thomas trains for Reuben for Christmas because of an amazing buy one get one sale (sometimes I do like black friday!) I was feeling like such a bad parent because I wanted to get him some of the play sets to go with the trains but it would have been irresponsible this month. check out this book and a few of Scott's other gems at www.ivp.com! 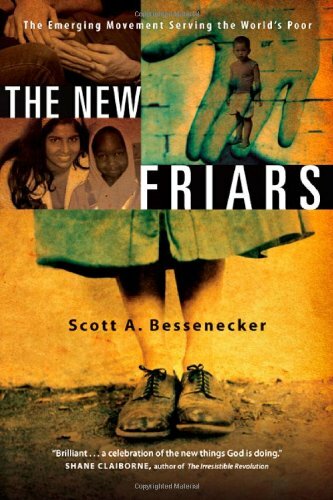 “In The New Friars Scott Bessenecker profiles young Christians who have voluntarily removed themselves from the status quo in order to seek justice and mercy with the poorest of the world’s poor. These new friars are carrying on the work of the monastic tradition, the spirit of Francis and Clare of Assisi, St. Patrick and St. Brigid, the Jesuits and Nestorians and Moravians. The New Friars will show you that with God all things—even uncommon acts of courageous faith—are possible.” Check it out people- good stuff! I’m thankful for Scott’s reminder that my worth isn’t found as a mom in the kinds of toys I buy for Reuben. It isn’t found in how cute I look in the lovely new boots my in-laws purchased for me of Christmas. It isn’t found in the glorious gifts I’ve carefully chosen for people I love in my life. It’s found in the thrill of hope that Jesus affords me in my life every single day, in his love and purpose for me that only grows more precious over the years, the kindness and acceptance he demonstrates thought there is much error and sin in my life. Man, I’m getting teared up as I type this post simply thinking about the different kind of gift Jesus is than the kind I usually pine for. If our kids need something, we should get it (some are in great need of clothes). But let’s get it when they need it. The idea is to dial down the association between consumerism on steriods and Jesus’ birth. Yes, Jesus was an amazing gift and it’s nice to celebrate by giving someone a gift, but this thing has gotten waaaay out of control! Of course home made gifts is alright. 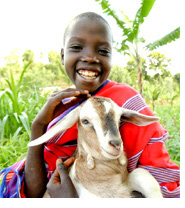 Buy a goat or chicken in the name of a family member through one of the many charities that do that sort of thing. goats! check out the world vision gift catalogue for more great ideas! Psychologically prepare for a Christmas morning that will not be about trying out all the new stuff. This may be a challenge for the kids. We’ll need to satisfy ourselves with hanging out in our PJ’s, eating and playing games on Christmas day (the thrill of new stuff is pretty short lived anyway). We watched “The Story of Stuff” together on Thanksgiving and chose to buy nothing on Friday. Admittedly I wouldn’t even be thinking about doing this because of my own moral convictions this holiday season if it had not been for our lean pocketbooks. Yet I’m glad for even small reminders that I can choose to focus on celebrating and gift giving this year that doesn’t make me feel guilty or put us in debt. I’d love to hear some of your ideas on how you’ve celebrated Christmas simply, tried to dial down consumerism and still managed to have a great time during the holidays. This is something that has torn me up for some time now. I am on this roller coaster where I truly can’t afford to do Christmas for anybody, but at the same time, I *LOVE* to give gifts . . . call it my “love language” or whatever, but I love nothing more than finding the perfect gift for someone . . . It tears me apart. Actually, everything about capitalism tears me apart. I am a product of my society and I hate it, but I am unable to break free of it. I want to scream every time I hear someone talk about how “blessed” we are to live in this country . . . because to me, all of this “stuff” feels much more like a curse than a blessing . . . and yet, I can’t let go. With that said, however, I do have to defend McDonald’s, because the McRib?! THAT is real joy. Truly, it is. Very well said, Jessica. Last year was the first year we were really faced with no money to spend on Christmas and I was totally fine with it until people began giving us gifts and we had nothing for them. (especially family that doesn’t understand where we are coming from) Like Lorraine said, this is also my love language-giving gifts. I’ve learned to be more creative and resourceful. This year it seems like it hit even harder as I realize that Nataleigh could really get into the whole opening gifts thing. But we have no money and it’s been this constant battle in my mind. I’m coming around, though and learning to be content and rest in enjoying what this should really be about-we are just constantly bombarded and it’s a daily battle to fight. good stuff. i love the idea of a freegan christmas. or how about a totally handmade christmas? i do struggle with how to handle extended family who might not share the same values and might have hurt feelings about receiving no gift (or a re-purposed one). part of that comes from being asian and wanting to do what everyone else is doing (giving gifts), as well as be generous/show off wealth. i think my children would actually really get into a freegan-type christmas, esp. if we fully explained why we were doing it. but i’m pretty sure i couldn’t stop extended family from buying them stuff. oh, and as far as other ways to celebrate christmas simply – we have always tried to give each child just three gifts (just like jesus received from the wise men) and make at least one handmade, if possible. we also give the children the gift of money to give to worldvision, and they look through the catalog and decide what they’d like to give with that money. i’ve also heard of families celebrating christmas without gifts and exchanging them for new year’s instead. My Mom always liked the “3 gifts” idea, too. She was very adamant about Christmas being about Jesus and for us kids to not be greedy about presents, because it’s not OUR birthday. So I’ve learned that. Thanks, Mom. JB’s family loves doing gifts, but Christmas day is also about singing carols, eating a lovely brunch, downing awesome eggnog, and playing board games or something together. It’s like “there’s presents, and then there’s Christmas.” I mean, we all do get time to play with our new “toys,” but somehow I don’t feel like it’s the focus there.